I e-mailed all my JW friends with a link to the first video, and the response has been an resounding silence. Mind you, it’s been less than 24 hours, but still I expected some response. Of course, some of my deeper thinking friends will need time to view and think about what they’re seeing. I should be patient. I expect most will disagree. I’m basing that on years of experience. However, it is my hope that some will see the light. Unfortunately, most Witnesses when confronted with a contrary argument to what they’ve been taught will dismiss the speaker by calling him an apostate. Is this a valid response? What is an apostate according to Scripture? That is the question I’m attempting to answer in the second video of this series. Hello. This is our second video. In the first, we discussed examining our own teachings as Jehovah’s Witnesses using our own criteria as we got originally from the Truth book back in ’68 and from subsequent books such as the Bible Teach book. However, we also discussed a few problems that stood in our way. We referred to them as the elephant in the room, or since there’s more than one, the elephants in the room; and we needed to dispense with those before we could really move on in our research of the Bible. Now one of elephants, perhaps the biggest one, is fear. It is interesting that Jehovah’s Witnesses go fearlessly from door to door and never know who’s going to answer the door—it could be a Catholic, or Baptist, or a Mormon, or a Moslem, or a Hindu—and they’re prepared for whatever comes their way. Yet, let one of their own question a single doctrine and suddenly they’re afraid. For example, if you’re watching this video now, I would guess that a few of you are sitting there privately waiting till everybody’s gone away…you’re all by yourself…now you’re watching…or if there’s others in the house, maybe you’re looking over your shoulder, just to make sure nobody’s watching you watch the video as if you are watching pornographic movies! Where does that fear come from? And why is it that rational adult people will react in such a way when discussing Bible truth? It seems to be very, very odd to say the very least. Now, do you love truth? I would say that you do; that’s why you’re watching this video; and that’s a good thing because love is the key factor in arriving at truth. 1 Corinthians 13:6—when it defines love in the sixth verse—says that love does not rejoice over unrighteousness. And of course falsehood, false doctrine, lies—they’re all part of unrighteousness. Well, love does not rejoice over unrighteousness but rejoices with the truth. So when we learn truth, when we learn new things from the Bible, or when our understanding is refined, we feel joy if we love truth…and that’s a good thing, this love of truth, because we don’t want the opposite…we don’t want the love of the lie. Revelation 22:15 talks about those who are outside the kingdom of God. There are different qualities such as being a murderer, or a fornicator, or an idolater, but among those is “everyone liking and carrying on a lie”. So if we like a false doctrine, and if we carry it on and perpetuate it, teaching it to others, we’re guaranteeing ourselves a place outside of the kingdom of God. So if we’re afraid, and if we’re letting fear restrain us from examining the truth, then we are not perfect in love. Now, what are we afraid of? Well, it may just be we’re afraid of being wrong. If we’ve believed something all our lives, were afraid of being wrong. Imagine when we go to the door and we meet someone of another religion—who has been in that religion all their life and believes it with all their heart—then we come along and we show them in the Bible that some of their beliefs are not Biblical. Well, many resist because they don’t want to give up a lifelong belief, even though it’s wrong. They’re afraid of change. In our case though there’s something else, something that’s pretty much unique to Jehovah’s Witnesses and a few other religions. It’s that we’re afraid of being punished. If a Catholic, for example, disagrees with the Pope over birth control, so what? But if a Jehovah’s Witness disagrees with the Governing Body over something and voices that disagreement, he’s afraid of being punished. He’ll be taken into the back room and talked to, and if he doesn’t desist, he could be thrown out of the religion which means being cut off from all of his family and all his friends and everything he’s ever known and loved. So that kind of punishment keeps people in line. Fear is what we want to avoid. We just reviewed that in the Bible, because fear casts love out and love is the way we find truth. Love rejoices in truth. So really if fear is what is motivating us we have to wonder, where does that come from? Satan’s world rules with fear and greed, the carrot and the stick. You either do what you do because of what you can get, or you do what you do because you’re afraid of being punished. Now I’m not categorizing every human that way, because there are many humans who follow the Christ, and follow the course of love, but that isn’t Satan’s way; that’s the point: Satan’s way is fear and greed. So, if we are allowing fear to motivate us, to control us, then who are we following? Because Christ…he rules with love. So how does this affect us as Jehovah’s Witnesses? And what is the real danger of our belief in apostasy? Well let me illustrate that with an example. Let’s say I’m an apostate, okay, and I begin to deceive people with artfully contrived stories and personal interpretations. I cherry-pick Bible verses, picking ones that seem to support my belief, but ignoring others that would deny it. I depend on my listeners to be either too lazy, or too busy, or just too trusting to do the research for themselves. Now time goes by, they have children, they educate their children in my teachings, and children being children, completely trust their parents to be the source of truth. So soon I have a large following. Years go by, decades go by, a community develops with shared values and shared traditions, and a strong social element, a sense of belonging, and even a mission: the salvation of mankind. Following my teachings… that salvation is a bit skewed from what the Bible says, but it’s enough in line that it’s convincing. Fine, okay, everything’s hunky-dory, until someone comes along who knows the Bible, and he challenges me. He says, “You’re wrong and I’ll prove it.” Now what do I do? You see, he’s armed with the sword of the spirit, as Hebrews 4:12 says. I’m not armed with anything, all I have in my arsenal are lies and falsehoods. I have no defense against the truth. My only defense is what is called an ad hominem attack, and that is essentially attacking the person. I can’t attack the argument, so I attack the person. I call him an apostate. I’d say, “He’s mentally diseased; his words are poisonous; don’t listen to him.” Then I’d appeal to authority, that’s another argument that is used, or what they call a logical fallacy. I’d say, “Believe because I’m the authority; I’m God’s channel, and you trust God, and therefore you must trust me. So don’t listen to him. You must be loyal to me, because being loyal to me is being loyal to Jehovah God.” And because you do trust me—or because you’re afraid of what I can do by convincing others to turn against you if you turn against me, whatever the case—you don’t listen to the person I’ve called an apostate. So you never learn the truth. Jehovah’s Witnesses don’t really understand apostasy that’s one thing I’ve learned. They have an idea of what it is, but it’s not the Biblical idea. In the Bible, the word is apostasia, and it is a compound word that literally means ‘to stand away from’. So, of course, you can be an apostate to anything that you formerly joined and now stand away from, but we’re interested in Jehovah’s interpretation. What does Jehovah say is an apostate? In other words whose authority are we standing away, from the authority of men? The authority of an organization? Or the authority of God? Now we love to use the latter part of this to say, ‘So you shouldn’t even talk to an apostate’, but that’s not what he says. He says, ‘if someone does not bring to you…’, he comes and does not bring this teaching, so, how do you know he doesn’t bring that teaching? Because someone told you? No! That means you’re allowing someone else’s judgment to determine your judgment. No, we must determine for ourselves. And how do we do that? Because the person comes, and he brings a teaching, and we listen to that teaching, and then we determine whether the teaching is in the Christ. In other words, he has remained in the teaching of the Christ; or whether that teaching is departing from the teaching of the Christ and that person is pushing ahead. If he’s doing that, then we personally determine for ourselves not to say a greeting to the person or have them in our homes. That makes sense, and see how that protects you? Because that illustration I gave, where I had my own followers, they weren’t protected because they listened to me and didn’t even let the person say a word. They never heard the truth, they never got a chance to hear it, because they trusted in me and were loyal to me. So loyalty is important but only if it’s loyalty to the Christ. We cannot be loyal to two people unless they are exactly and completely in harmony, but when they deviate, we have to choose. It’s interesting that the word ‘apostate’ doesn’t occur in the Christian Greek Scriptures at all, but the word ‘apostasy’ does, on two occasions. I’d like to show you those two occasions because there’s a much to be learned from them. 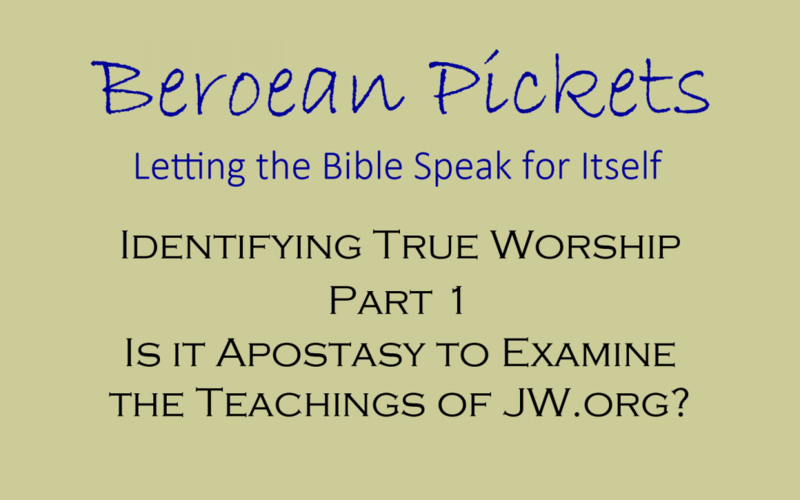 We’re going to examine the use of the word apostasy in the Christian Greek Scriptures. It only occurs twice. One time, in not a valid sense, and the other and in very valid sense. We’ll look at both, because there’s something to be learned from each; but before we do, I’d like to set the groundwork, by looking at Matthew 5:33 and 37. Now, this is Jesus talking. This is the Sermon on the Mount, and he says in Matthew 5:33, “Again, you heard that it was said to those of ancient times: ‘You must not swear without performing, but you must pay your vows to Jehovah'”. Then he goes on explaining why that should no longer be the case, and he concludes in verse 37 by saying, “Just let your yes mean yes and your no, no, for what goes beyond these is from the wicked one.” So he’s saying, “Don’t vow any more”, and there’s logic to that, because if you vow and you fail to keep it, you have actually sinned against God, because you made a promise to God. Whereas if you simply say your Yes is Yes, and your No, No… you’ve broken a promise, that’s bad enough, but that involves humans. But adding the vow involves God, and so he’s saying “Don’t do that”, because that’s from the Devil , that’s going to lead to bad things. So this is a new law; this is a change, okay?…introduced by Jesus Christ. So with that in mind, let’s now look at the word “apostasy”, and just to make sure we cover all the bases, I’m going to use a wild-card character (*) to make sure that if there are other words like “apostate” or “apostatizing”, or any variations of the verb, we’ll find those as well. So here in the New World Translation, the latest version, we find forty occurrences—a lot of them are in the outlines—but there’s only two appearances in the Christian Greek Scriptures: one in Acts, and one in Thessalonians. So we’ll go to Acts 21. Zealous for the law? The law of Moses is no longer in effect. Now, one can understand them obeying the law, because they were living in Jerusalem, and under that environment, but it’s one thing to comply with the law, it’s quite another thing to be zealous for it. It’s like they were trying to be more Jews than the Jews themselves! Why? They had the law of the Christ’. Well, Paul said in his own writings that he was a Greek to the Greek and a Jew to the Jews. He became whatever he needed to be so that he might gain some for the Christ. So if he was with a Jew he kept the Law, but if he was with a Greek he didn’t, because his goal was to gain more for the Christ. Now why Paul didn’t insist at this point, ‘No brothers this is the wrong way to go’, we don’t know. He was in Jerusalem, there was the authority of all the older men there. He decided to go along, and what happened? Well the appeasement didn’t work. He ended up being imprisoned and spent the next two years going through many hardships. In the end, it resulted in a greater preaching, but we can be sure that this wasn’t Jehovah’s way of doing it, because he does not test us with evil or bad things, so this was Jehovah allowing the errors of men to result, in the end, for something profitable or good for the good news, but that doesn’t mean that what these men were doing was approved by God. Certainly calling Paul an apostate, and spreading rumors about him, that was not approved by Jehovah for sure. So there we have one use of apostasy, and why was it being used? Basically out of fear. The Jews lived in an environment where if they stepped out of line they could be punished, so they wanted to appease the people in their area to make sure that they didn’t have too many problems. We remember initially a great persecution broke out and many fled and the good news got spread wide and far because of that… fine… fair enough, but those who remained and continued to grow found a way of getting along. We should never allow fear to influence us. Yes, we should be cautious. The Bible says “cautious as serpents and innocent as doves”, but it doesn’t mean we compromise. We must be willing to carry our torture stake. Now, the second occurrence of apostasy is found in 2 Thessalonians, and this occurrence is a valid one. This is an occurrence that affects us today, and one we should heed. In verse 3 of chapter 2, Paul says: “Let no one lead you astray in any way, because it will not come unless the apostasy comes first, and the man of lawlessness gets revealed, the son of destruction. He stands in opposition and exalts himself above every so-called god or object of worship, so that he sits down in the temple of God publicly showing himself to be a god.” Now, the temple of God we know is the congregation of anointed Christians, so this one sits down in God’s temple publicly shows himself to be a god. In other words, as a god commands and we must obey unconditionally, so this man acting like a god, commands and expects unconditional and unquestioning obedience to his direction, commands, or words. That’s the kind of apostasy we should be wary of. It’s top-down apostasy, not bottom-up. It’s not the odd person nipping at the heels of the leaders, but actually it starts with the leadership itself. How do we identify it? Well, we’ve already analyzed that, let’s carry on. Jesus knew that fear would be one of the greatest enemies we have to face in a search for truth, and that’s why he told us at Matthew 10:38, “Whoever does not accept his torture stake and follow after me is not worthy of me.” What did he mean by that? At that point in time no one knew, except him, that he was going to die that way, so why use the analogy of a torture stake? Are we supposed to die painful, ignominious deaths? No, that’s not his point. His point is that, in Jewish culture, that was the worst way to die. A person who was condemned to die that way first was stripped of everything he had. He lost his wealth, his possessions, his good name. His family and his friends turned their back on him. He was shunned completely. Then finally, he was nailed to this torture stake, stripped of his clothing even, and when he died, instead of going to a decent burial, his body was thrown into the Valley of Hinnom, to be burned. So he told everybody, all the way up to the kings. Now there was really only one king, so what it means there is the rulers. The king ruled, the priests ruled, the older men ruled, all different levels of authority. He talked to them all. He was talking to the governors or governing body of the nation at that time. Now what happened? According to Jeremiah 17:18 he prayed to Jehovah, “Let my persecutors be put to shame.” He was persecuted. He describes plots to have him killed. You see, what we might think is an apostate might very well be a Jeremiah—someone who is preaching truth to power. So, if you see someone being persecuted, being shunned, there’s a good chance he’s not an apostate—he’s a speaker of truth. What’s it all about? Well, obviously fear. Fear is what keeps us from studying the Bible, together, and that’s what I want to do. That’s all I want to do…study the Bible together; let you draw your own conclusions from what we study, and as you’ve seen from this video and the previous one, I use the Bible a lot, and you’re able to look up the scriptures with me, hear my reasoning and determine for yourself, whether what I’m saying is true or false. The other point of this video is to not fear apostasy, or rather charges of apostasy, because apostasy, the misuse of that, has been used to keep us in line. To keep us from knowing all the truth, and there is truth to be known that is not available to us in the publications, and we will get to that, but we can’t be afraid, we can’t be afraid of examining it. We are like a person who is driving a car guided by a GPS unit which has always proven reliable, and we’re well on our way, well that down a long path or long route to our destination, when we realize that the landmarks don’t match what the GPS is saying. We realize at that point that the GPS is wrong, for the first time. What do we do? Do we keep following it, hoping it’ll get right again? Or do we pull over and go and buy an old-fashioned paper map, and ask somebody where we are, and then figure it out for ourselves? This is our map [holding up the Bible]. It’s the only map we have; it’s the only writing or publication that we have that is inspired of God. Everything else is by men. This is not. If we stick with this, we’ll learn. Now some might say, ‘Yes but don’t we need someone to tell us how to do it? Someone to interpret it for us?’ Well, put it this way: It was written by God. Do you think he’s incapable of writing a book that you and I, ordinary people, can understand? Do we need someone more intelligent, a wise and intellectual one? Did not Jesus say that these things are revealed to babes? We can figure it out for ourselves. It’s all there. I’ve proven that myself, and many others apart from me have found the same truth. All I’m saying is, “don’t be afraid anymore.” Yes, we must act cautiously. Jesus said, “cautious as serpents, innocent as doves”, but we have to act. We can’t sit on our hands. We have to continue to strive to get a better closer personal relationship with our God Jehovah and we cannot get that except through Christ. His teachings are what will guide us. These are valid questions and there are valid and actually very comforting answers to them, if you’ll just take the time to consider them with me. So we’re going to leave that for the next video, and we’ll talk about the organization; what it really means; and where do we go if we have to go anywhere. You’d be surprised at the answer. Until then, thank you very much for listening. I’m Eric Wilson. Thanks pquin7. Once again, the NWT fails us. That being said, as I re-read that section, I can see that it is fear of being punished by the Organization–fear of being shunned–that restrains many from examining the truth. That isn’t the intent of Paul’s words, however, but the principle behind his words seems to apply. Witnesses are driven by fear, not love. Not love of truth and not love of brother. I started Laughing after when I realized that this was so true for me. The only reason for making such a big thing of apostasy, is that those at the top are seriously worried that people will leave, and that is all they can offer, namely threats, just like the 2016 Convention with the bunker videos, and the constant going on about how close the end is. What ever happened to plain and simple truth, the one thing that would probably keep us listening to them ? It might well have stopped some of us from making enquiries as to what the GB are up to, what they have done in the past, and it might have even discouraged us from going on apostate websites. Oh well, I guess you reap what you sow. UPDATE: THE PROBLEM IS RESOLVED. I can’t seem to find the thread for posting in regards to your last video on “this generation” so I will do it here. Thank you for explaining the seeming contradiction in regards to the “seasons” that Jesus spoke about.For a while I had noticed these 2 seemingly contradictions but didn’t really know what to make of it. And am mostly thankful to finally understand what “he is near, at the door” really means. I also appreciate you not concentrating on bashing the jw’s. You also have a mild disposition that dispels the “raging apostate” stereotype that the GB warns their members of. All of this makes it easier to share your videos with our spouses who are still under the spell of the org. I am hoping to maybe be able to do that in the not too distant future. I anticipate your next videos. If the word “apostasy” is only mentioned twice in the Greek scriptures, it would seem to indicate that for early Christians it was not something that merited much attention let alone something to be extremely fearful of. This would seem to indicate that his sheep who dearly love him will not be deceived by a stranger’s (apostate) voice. Paul was certainly not afraid to listen to all views fearing that perhaps he might be swept away from God’s love. In fact he said that nothing in creation could separate him from that love Rom 8: 31-39. He also encouraged Christians to “make sure of all things” This would necessitate listening, for a while at least, to all kinds of viewpoints. And then decide whether it was something “fine” to “hold on to” or not. Thanks for a great commentary on apostasy, Meleti. I intended to start writing a letter to my family on where I stand wrt “The Truth” just now, but as my computer stalled on updates, I ended up watching your video on my iPhone. Strangely enough, I intended to start up with 1 John 4:18. Recent days I have also been thinking a lot on how JW keep people in chains by means of fear. When Armageddon start losing its effect, then its over to the judical committee rack. If you are a Christian, one of the few places on earth you could be punished by following Jesus’ voice (and not the GB) is among JWs (apart from N. Korea and some moslem countries, if you are actively proselytizing, though). I became a JW because I wanted to do what’s right. Now I am staring into the unknown, realizing I probably need to leave (completely, not just fade) to do what’s right. The irony… at least I now have a “satisfied mind” (ref. Johnny Cash), and have started preparing a lodging in Pella. Ps: wrt the JW’s claim that all need to be taught by the the FDS/GB and obey its commandments to be saved, your thoughts on 1 John 2:27 is welcome. Hi John. Good question on 1 John 2:27. It really makes the point that we don’t need a governing body of men to teach us. Raymond Franz and Ed Dunlap arrived at the same truths I and others like me have arrived at in exactly the same way. We studied the Scriptures ourselves. How could I arrive at the same basic truths as they even though I’d never read their work nor that of anyone that knew them? Answer, because we were all getting our knowledge from the same source, God’s Word the Bible. I shall remember 1 John 2:27 the next time someone suggests that I cannot understand the Bible on my own. Thanks, Meleti. Good point on Franz&Dunlop (I remember your article on Franz’ book and the 8 items of apostasy the org used as its “water test”). We enjoy your videos very much Eric love them. If one treasure something you make time to watch them all and longing for the next one. As I am partially deaf one depends on view and subtitling. There are so many people specially the young ones becoming hard of hearing due to listening to music with the sound and beat as loud as they can, but the result is a whole generation becoming deaf. Your JW friends need time to process, what you wrote to them, giving time they may surprise you and you have found another brother in Christ. We will pray that our heavenly Father draws them through Jesus Christ. Hi Maria, Good to hear from you. I hadn’t thought about the hard of hearing and the deaf. YouTube videos have this amazing feature. The CC button turns on Closed Captioning. I say amazing, because I didn’t do anything to make that happen. The software creates the text by transcribing my voice. It is not perfect however. For example, when I said “Jehovah” the text read “over”. I wonder if there is a way to edit that text. I will have to explore that. I would love for you to put these videos into iTunes podcasts! These days it’s just so hard to find the time to watch videos, as great as yours are. I really enjoyed your first video. Thank you so much.